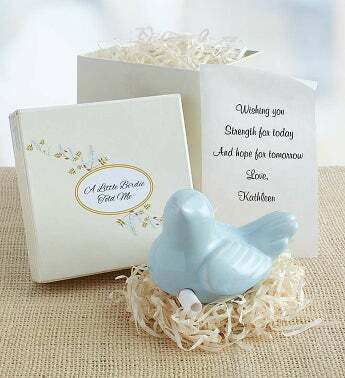 EXCLUSIVE Our comforting messenger bird will deliver your thoughtful sentiments into the hands and heart of someone mourning the loss of a loved one. Crafted from a rich polished stone, our lovely keepsake arrives in a delicate straw nest holding your message close. Placed in a peaceful decorative box, it’s a special momento for a friend or family member in need of love and encouragement. Our comforting messenger bird will deliver your thoughtful sentiments into the hands and heart of someone mourning the loss of a loved one. Crafted from a rich polished stone, our lovely keepsake arrives in a delicate straw nest holding your message close. Placed in a peaceful decorative box, it’s a special momento for a friend or family member in need of love and encouragement.